The leading independent specialist for windscreen replacement and windscreen repair based in Oxford and serving all of the Oxford area. National Windscreens Oxford fitting centre provides windscreen replacement and windscreen repair services to businesses and individuals throughout Oxford and the Oxford area. 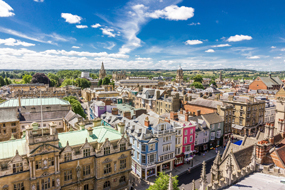 Oxford sits in one of the most beautiful counties in the UK. Oxfordshire offers a varied rural landscape which is excellent for walkers and cyclists as well as providing a gateway to the heritage and history of the town itself. The A40 runs around the centre of Oxford and provides a link to the M40 and the South West including London. The city is famed for its top quality university that ranks amongst the finest in the UK. The Oxford windscreen fitting centre and its mobile vehicle glass technicians service the needs of Oxford and the surrounding area including Bicester, Woodstock, Witney and Headington. With 108 fitting centres and over 800 mobile technicians, National Windscreens operates the UK's largest windscreen repair and windscreen replacement network. The company provides low cost, high quality windscreen replacement and windscreen repair from its Oxford fitting centre 24 hours a day, 7 days a week, 365 days a year. Repair and replacement of all types of vehicle glass including windscreens, rear windows and side windows is undertaken throughout Oxford and all of the Oxford area.